The Province of Halle-Merseburg in 1944. The Province of Halle-Merseburg (German: Provinz Halle-Merseburg) was a province of the Free State of Prussia from 1944–45. The provincial capital was the city Merseburg. Halle-Merseburg was created on 1 July 1944, out of Regierungsbezirk Merseburg, an administrative region from the former Province of Saxony. The governor of the new province was Joachim Albrecht Eggeling, the Gauleiter of the Nazi Gau Halle-Merseburg. 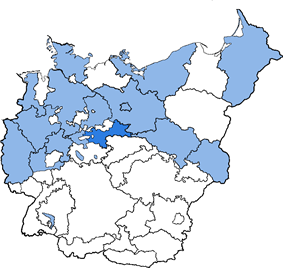 In 1945, the Province of Halle-Merseburg was dissolved into a recreated Province of Saxony.